Propane is a three-carbon alkane, normally a gas, but compressible to a liquid that is transportable. It is derived from other petroleum products during oil or natural gas processing. It is commonly used as a heat source for engines, barbecues, and homes. Its name was derived from propionic acid. When commonly sold as fuel, it is also known as liquified petroleum gas (LPG or LP-gas) and can be a mixture of propane with smaller amounts of propylene, butane, and butylene. The odorant (ethanethiol) is also added so that people can easily smell the gas in case of a leak. In North America, LPG is primarily propane (at least 90 percent), with the rest mostly butane and propylene. This is the HD5 standard, primarily written for vehicle fuels; note that not all product labeled "propane" conforms to this standard. Propane was first identified as a volatile component in gasoline by Dr. Walter O. Snelling of the U.S. Bureau of Mines in 1910. Some owners complained of disappearing fuel, between the time they had filled up and the time they arrived home. Propane is not produced for its own sake, but as a byproduct of two other processes: natural gas processing and petroleum refining. The processing of natural gas involves removal of propane and butane from the natural gas, to prevent condensation of these liquids in natural gas pipelines. Additionally, oil refineries produce some propane as a by-product of production of gasoline or heating oil. The supply of propane cannot be easily adjusted to account for increased demand because of the by-product nature of propane production. About 85 percent of U.S. propane is domestically produced. The United States imports about 10-15 percent of the propane consumed each year. Propane is imported into the United States via pipeline and rail from Canada, and by tankers from Algeria, Saudi Arabia, Venezuela, Norway, and the United Kingdom. After it is produced, North American propane is stored in huge salt caverns located in Fort Saskatchewan, Alberta, Canada, Mont Belvieu, Texas, and Conway, Kansas. These salt caverns were hollowed out in the 1940s and can store up to 80 million barrels of propane, if not more. When the propane is needed, most of it is shipped by pipelines to other areas of the Midwest, the North, and the South, for use by customers. Propane is also shipped by barge and rail car to selected U.S. areas. When not enough oxygen is present for complete combustion, propane burns to form water and carbon monoxide. Unlike natural gas, propane is heavier than air (1.5 times denser). In its raw state, propane sinks and pools at the floor. Liquid propane will flash to a vapor at atmospheric pressure and appears white due to moisture condensing from the air. When properly burned, propane produces about 2,500 BTU of heat per cubic foot of gas. Propane is nontoxic; however, when abused as an inhalant it poses a mild asphyxiation risk through oxygen deprivation. It must also be noted that commercial product contains hydrocarbons beyond propane, which may increase risk. Propane and its mixtures may cause frostbite during rapid expansion. Propane combustion is much cleaner than gasoline, though not as clean as natural gas. The presence of C-C bonds, plus the C=C bond of propylene, create organic exhausts besides carbon dioxide and water vapor. These bonds also cause propane to burn with a visible flame. 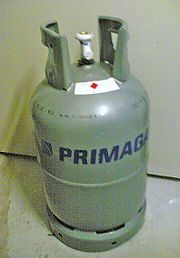 Retail sale of propane cylinders. It is used as fuel in cooking on many barbecues and portable stoves, and in motor vehicles. The ubiquitous, 5-gallon steel container has been dubbed the "barbecue bottle." Propane powers some locomotives, buses, forklifts, and taxis and is used for heat and cooking in recreational vehicles and campers. In many rural areas of North America, propane is also used in furnaces, stoves, water heaters, laundry dryers, and other heat-producing appliances. 6.5 million American households use propane as their primary heating fuel. Also recently, Tippmann, a paintball company, has made a paintball gun called the "C3." This gun's propellent is propane as opposed to the usual carbon dioxide or nitrogen. In North America, local delivery trucks called "bobtails" fill up large tanks that are permanently installed on the property (sometimes called pigs), or other service trucks exchange empty bottles of propane with filled bottles. The bobtail is not unique to the North American market, though the practice is not as common elsewhere, and the vehicles are generally referred to as tankers. In many countries, propane is delivered to consumers via small or medium-sized individual tanks. Propane is the fastest growing fuel source in the Third World, especially in China and India. Its use frees up the huge rural populations from time-consuming ancient chores such as wood gathering and allows them more time to pursue other activities, such as increased farming or educational opportunties. Hence, it is sometimes referred to as "cooking gas." On an aside, North American barbecue grills powered by propane cannot be used overseas. The "propane" sold overseas is actually a mixture of propane and butane. The warmer the country, the higher the butane content, commonly 50/50 and sometimes reaching 75 percent butane. Usage is calibrated to the different-sized nozzles found in non-U.S. grills. Americans who take their grills overseas — such as military personnel — can find U.S.-specification propane at AAFES military post exchanges. Retail sale of propane in Monmouth, Oregon. North American industries using propane include glass makers, brick kilns, poultry farms, and other industries that need portable heat. Additionally, most of the entire North American chemical industry uses propane to power their huge facilities that crack or distill industrial chemical products. Propane is also instrumental in providing off-the-grid refrigeration, also called gas absorption refrigerators. Made popular by the Servel company, propane-powered refrigerators are highly efficient, do not require electricity, and have no moving parts. Refrigerators built in the 1930s are still in regular use, with little or no maintenance. However, certain Servel refrigerators are subject to a recall for CO poisoning. In highly purified form, propane (R-290) can serve as a direct replacement in mechanical refrigeration systems designed to use R-12, R-22, or R-134a chloro- or fluorocarbon based refrigerants. Today, the Unilever Ice Cream company and others are exploring the use of environmentally friendly propane as a refrigerant. As an added benefit, users are finding that refrigerators converted to use propane are 9-15 percent more energy efficient. Propane is also being used increasingly for vehicle fuels In the U.S., 190,000 on-road vehicles use propane, and 450,000 forklifts use it for power. It is the third most popular vehicle fuel in America, behind gasoline and diesel. In other parts of the world, propane used in vehicles is known as autogas. About nine million vehicles worldwide use autogas. The advantage of propane is its liquid state at room temperature. This allows fast refill times, affordable fuel tank construction, and ranges comparable to (though still less than) gasoline. Meanwhile it is noticeably cleaner, results in less engine wear (due to carbon deposits) without diluting engine oil (often extending oil-change intervals), and until recently was a relative bargain in North America. However, public filling stations are still rare. Many converted vehicles have provisions for topping off from "barbecue bottles." Purpose-built vehicles are often in commercially owned fleets, and have private fueling facilities. Propane is generally stored and transported in steel cylinders as a liquid with a vapor space above the liquid. The vapor pressure in the cylinder is a function of temperature. When gaseous propane is drawn at a high rate the latent heat of vaporization required to create the gas will cause the bottle to cool (this is why water often condenses on the sides of the bottle and then freezes). In extreme cases this may cause such a large reduction in pressure that the process can no longer be supported. In addition, the lightweight, high-octane compounds vaporize before the heavier, low-octane ones. Thus, the ignition properties change as the tank empties. For this reason, the liquid is often withdrawn using a dip tube. Propane is also used as a feedstock for the production of base petrochemicals in steam cracking. It is used in some flamethrowers, as the fuel, or as the pressurizing gas. Some propane becomes a feedstock for propyl alcohol, a common solvent. It is used as fuel in hot air balloons. It is used as a propellant along with silicon (for lubrication) in airsoft guns. This page was last modified on 5 June 2015, at 14:48.